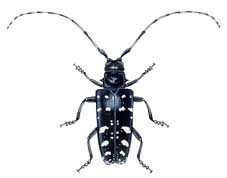 An Asian Long Horned Beetle was found in a warehouse in the Mason, Ohio area in June of 2009. Although there have been no more sightings as of February 2010, the fact that an Asian Long Horned Beetle was found in the Greater Cincinnati tree service area means that it’s only a matter of time before this infestation starts here. Unlike the Emerald Ash Borer, which feeds only on ash trees, the Asian Long Horned Beetle feeds on about fifteen different species, starting with oaks and maples. Fortunately, the same treatment system that has proven effective for the Emerald Ash Borer, also works on the Asian Long Horned Beetle.